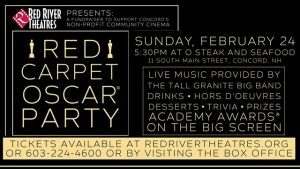 Home » Events » Red River Theatres’ Red Carpet Oscar Party! « River Day at Bretton Woods Mountain Resort! Walk down the red carpet with Red River Theatres for their Oscar viewing party! The party starts at 5:30pm at O Steaks and Seafood before moving to Red River Theatre. Tickets can be purchased here from Red River Theatres, and attendees can RSVP on Facebook!